I start off most of these with a restatement of my stance on the subject and I still think it's worth repeating: I want more and 'stronger' female protagonists. Where I differ from the vast majority of modern critics arguing for the same thing is that I think their methods are counterproductive and hostile. By always focusing on the negative, you can accidentally end up exacerbating it. They'll defend this by saying they're just highlighting sexism. Exactly, one highlights something because one considers it most important and that's not always a good thing. Furthermore this causes confusion with the artists on what the public really wants (since they only get feedback on what they don't want while all the good stuff is ignored) and hostility from the fans who do like certain things that are being argued against (and this being art and entertainment, the morality of anything done to fictional characters is largely irrelevant anyway). Therefore I think we should be focusing on the positives. Highlight what we think should be in the public zeitgeist so we as a collective start thinking positively about these characters rather than just keeping them locked into a cycle of stereotypes and negativity. Current media critics do little more than make the entire conversation an annoying bore while they actively train themselves to be offended at everything (and then they suddenly wonder why they never noticed how everything was so offensive before). 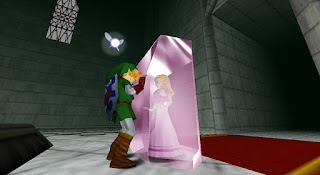 This post can also serve as an addendum to my earlier post The Ordeal of Queen Zelda, which attempts to look at Princess Zelda, as portrayed in Ocarina of Time, in function of the monomyth. One thing I see brought up occasionally is people scratching their heads at the kidnapping of Princess Zelda in The Legend of Zelda: Ocarina of Time and how the scene supposedly makes no sense. 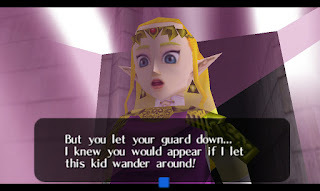 Worse are the weird ones who imply (if not outright state) that Zelda, after years of masquerading as Sheik, only gets kidnapped because she revealed herself as a woman, rather than the blatantly obvious fact that she revealed herself to be the princess (at that moment probably even the uncrowned queen) of the land Ganondorf is trying to take over, as well as the wielder of a part of the ancient 3 Goddess'-powered artifact he spent the entire game and the rest of the series assembling. Tvtropes is just weird about it. "Badass Decay: Zelda was hit with this the moment she was kidnapped by Ganondorf after revealing herself to Link, for no explained reason; especially if you take account that she spent seven years as a Sheikah warrior." That just doesn't make any sense. What do you mean, no explained reason? She was blindsided and got magically locked in crystal by one of the most powerful sorcerers in the land. It doesn't seem all that unreasonable for her to require a bit of help at that point. There's one thing to keep in mind. Zelda's kidnapping is overstated (as it usually is). The Legend of Zelda: Ocarina of Time is a roughly 30 hour game going by my last playthrough (likely a lot longer for a new player. How Long To Beat has it between 26.5 to 38.5 hours depending on playstyle). Princess Zelda is the mastermind behind everything happening on the good side for about 29 hours of those, which is also a full 7 years in-game, and only gets kidnapped right before the final battle with Ganondorf, after which she's also the one to imprison him for 100's of years until the events of Wind Waker (Link only weakens Ganondorf enough so Zelda's magic can overpower him). For the remainder of the game she's both the one guiding Link (first as Hyrule's princess, then from the shadows as the mysterious Sheikah warrior unimaginatively named 'Sheik') and being a hero behind the scenes in her own right (as mentioned by the Zora princess Ruto, who was helped by Sheik when Zora's Domain froze over). Firstly, the reason why Zelda gets kidnapped so sudden is very simple. 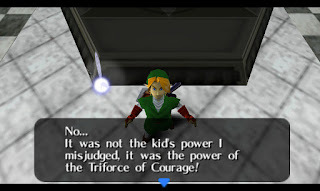 It's established early on that Ganondorf was watching Link as he progressed through the game (merely implied by the nightmare Link has when he first pulls the Master Sword from its pedestal, if indeed a nightmare at all, and outright stated when Link defeats Ganondorf's phantom in the Forest Temple). Since Ganondorf needs both Link and Zelda to complete the Triforce, we can fairly safely assume he didn't intervene directly with Link's quest because he wanted to lure Zelda out in the open, heck he explicitly says this when he finally captures Zelda. Losing the temples is only a minor setback if it means gaining the entire Triforce. Secondly, why did he capture Zelda instead of Link, or why only Zelda and not both of them? Well he is still underestimating Link and says as much by claiming everything he did was merely the result of Link somehow having the Triforce of Courage. He simply doesn't take this kid from the forest seriously. Furthermore, by virtue of being Courage he knows Link will immediately come to face him anyway. 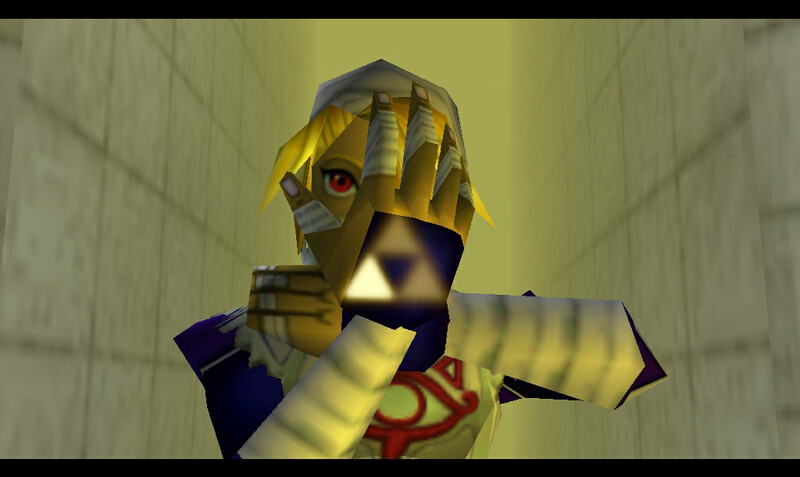 Heck, had Sheik not intercepted Link when he first walked out of the Temple of Time during his adult years, he might have gone to face Ganon right then and there and likely lost (maybe that's where the Failed Hero timeline according to Hyrule Historia came from: Zelda herself might have gone back in time to prevent Link from facing Ganon too early, thus causing the second split). Zelda on the other hand is Wisdom. She knows better than to foolishly run into danger head-on and instead calculates her approach. Indeed when she knew she couldn't go up against Ganondorf, she hid for 7 years and undermined his rule from the shadows. This attitude is symbolically reflected in Zelda's frequent use of bows, especially later in the series: She prefers to strike from a distance. Unfortunately she slipped up by revealing herself to Link. "I knew you would appear if I let this kid wander around!" In short, Ganondorf took Zelda seriously as a threat, unlike Link who he found merely amusing. Zelda had to be removed from the game while he thought he could just toy with this boy from the forest. That is why Ganondorf kidnapped Zelda rather than Link.